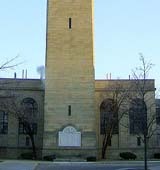 Affiliated with the Roman Catholic Church, the University of Detroit Mercy provides a liberal arts education as well as a variety of pre-professional programs. Detroit Mercy operates two Detroit area campuses and enrolls 3,100 traditional and non-traditional undergraduate students. Author Elmore Leonard, whose book Rum Punch was the basis for the movie Get Shorty, is an alum. Describe the type of student who should not attend University of Detroit Mercy and explain why. Describe the type of student who should attend University of Detroit Mercy. Why? What is a typical University of Detroit Mercy student like? Describe the type of person that should attend University of Detroit Mercy. We here at the university od Detroit mercy, the student are very divers. Basically any type of person should attend this multiverse community. What are the top 3 reasons someone should attend University of Detroit Mercy? Great post graduation employment ranking, excellent student life, and diverse culture of students that allows one to excel in learning the importance of diversity. What was a typical University of Detroit Mercy student like in high school? Describe the type of person that should attend University of Detroit Mercy. What are the top 3 things that students do for fun at University of Detroit Mercy? Here at the university of Detroit mercy, some thing the students do for fun is playing intermural sports, or hanging out with friends and or joining clubs. 24% of students graduated in the top tenth of their class. The average student pays $24,223 for tuition, fees, and other expenses, after grants and scholarships. Total stated tuition is $35,920, in-state and on-campus, before financial aid. Learn more about financial aid at http://www.udmercy.edu/apply/financial_aid/. Estimate the net price for you at http://www.udmercy.edu/apply/financial_aid/cost/netprice/index.htm. The typical (median) early career salary of University of Detroit Mercy graduates is $48,100, according to Payscale. University of Detroit Mercy participates in the NCAA Division I-AAA for college athletics. Want more info about University of Detroit Mercy? Get free advice from education experts and Noodle community members. What do you need to attend the master in Mechanical Engineering program? Can I take English language courses in January of 2016?